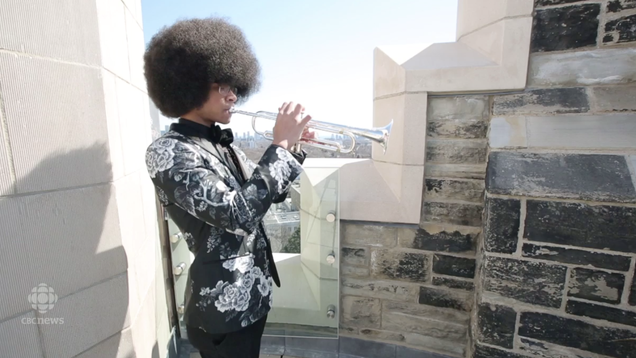 William Leathers is trying to raise money to attend the prestigious Juilliard School in New York City, where he’ll be one of three trumpeters in the undergraduate program. Five years later, William has received that coveted invitation to study at one of the world’s most renowned—and selective—music programs (Marsalis himself is a member of the jazz faculty at the school). But the Canadian teen has one major hurdle: the cost of attendance. William is just one of three undergraduate trumpeters to be offered a spot at the prestigious New York City school, CBC.ca reports, but because he is an international student, his family will need to fork over $364,000 in Canadian dollars to cover his tuition and housing for four years (that’s almost $71,000 U.S. dollars per year). “There’s been some scholarship offered from Juilliard, but not all, and Juilliard’s very expensive,” William said. The award-winning musician, who is also a classical pianist, is ineligible for most Canadian scholarships, since he’s going out of the country to study. The family has been able to pool together $25,000 for the first year but started a crowdfunding campaign last weekend to make up the rest of the $65,500 in Canadian dollars that William needs for the first year. As of Wednesday morning, his YouCaring campaign had raised more than $52,000—a little more than $10,000 short of his goal. Donors—some of whom had seen William play in the past—offered words of encouragement and support to him along with their donations. People on social media have also been spreading the word, sharing his story and clips of him performing. “People that don’t even know me, all these people in Canada are trying to help me out,” he said.